At this time of the year, I’ve noticed that people start sharing what makes them thankful. Why just the holidays? Why not be openly thankful throughout the year? I’m thankful for many things, both personally and professionally. I am especially grateful for all of the people I care about and their significance in my life. The holiday season isn’t just a time to self-reflect on gratitude; it’s also the perfect opportunity to take a look at the world outside your circle and see how you can give back and make a difference throughout the year. There are many ways you can start doing this over the next month or so; help at a local food bank, sort coats for a clothing drive, serve a meal at your local homeless shelter...or how about all of the above? Here at Onix, we have a new community service initiative revving up. 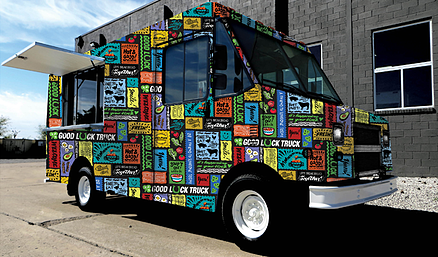 We’re getting ready to roll out the “Good Luck Truck” to provide free meals to people in need. We want to make sure we share hot meals and love all year round, not just at this special time of the year. We’re all blessed to have things that make us thankful. Let’s celebrate that gratitude openly by thanking those who make a difference in our lives. Your family, friends, co-workers, clergy, the neighborhood police officer...it could be anyone. Then step out in the world to share your time, talent and caring throughout the year. It will make a difference in your lives and for those you serve.